Product #21352 | SKU H-X015E-K | 0.0 (no ratings yet) Thanks for your rating! 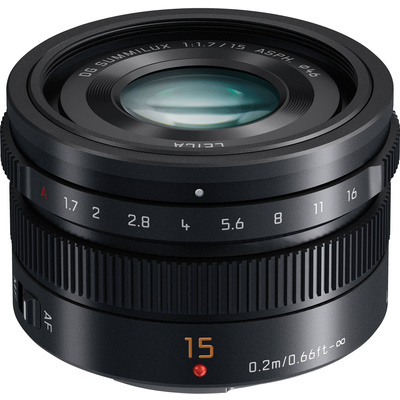 Fast and versatile, the Leica DG Summilux 15mm f/1.7 ASPH. from Panasonic is a 30mm equivalent wide-angle lens for Micro Four Thirds mirrorless cameras. Its bright f/1.7 maximum aperture benefits working in low-light conditions and also avails greater control over the focus position for shallow depth of field and selective focus techniques. Intuitive control over the aperture selection is also possible through the use of the manual aperture ring. In regard to focus, an internal focusing system with a stepping AF motor promotes fast, quiet, and smooth performance. The optical design incorporates three aspherical elements to reduce distortion and spherical aberration for sharper imagery with greater overall clarity. Additionally, a Nano Surface Coating has been applied to lens elements to suppress lens flare and ghosting for more contrast-rich, colour-neutral photos and movies.